Democrats rode a wave of firsts on Tuesday, with voters in Vermont nominating the first openly transgender woman as their gubernatorial candidate and Democrats in Connecticut tapping the first African-American Democrat for a House seat in the state's history. They were among the big highlights from a round of primaries across Minnesota, Wisconsin, Connecticut and Vermont that also featured Rep. Ilhan Omar, a Muslim woman, emerging as the Democratic nominee for a House seat currently held by another Muslim, Rep. Keith Ellison (D-Minn.). Meanwhile, establishment candidates prevailed in Senate races in Wisconsin, where state Sen. Leah Vukmir, who won the endorsement of the state GOP earlier this year, emerged victorious over Marine Corps veteran Kevin Nicholson, a former Democrat who cast himself as a political outsider. [post_ads]Likewise, in Minnesota, Sen. Tina Smith (D-Minn.) overcame a challenge from Richard Painter, a former ethics lawyer for President George W. Bush, in one of the state's Democratic Senate primaries. It was a good night for the establishment, especially in Wisconsin's GOP primary for Senate. Vukmir, who won the Wisconsin Republican Party's endorsement in May, edged out first-time candidate Nicholson in the state's GOP Senate primary, setting her up to challenge incumbent Sen. Tammy Baldwin (D-Wis.) in November. Vukmir won the support of prominent Republicans and conservatives groups, including Speaker Paul Ryan (R-Wis.), former White House chief of staff and Wisconsin GOP chairman Reince Priebus, and the National Rifle Association. Nicholson sought to cast Vukmir, a longtime player in Wisconsin Republican politics and an ally of Walker, as a political insider. But that line of attack failed to work with Wisconsin's GOP primary voters. That's not to say that President Trump was absent from the race. Though he didn't endorse anybody, Vukmir often name-checked Trump's policy proposals on the campaign trail, expressing her support for his long-promised border wall and pledging to help "drain the swamp" in Washington. Her support for Trump was meant to inoculate herself from charges from Nicholson of being insufficiently loyal to the president. Vukmir had made critical comments of Trump in the past, and initially supported Wisconsin Gov. Scott Walker during the 2016 GOP presidential primaries, before backing Sen. Marco Rubio (R-Fla.). But as a former Democrat, Nicholson was also vulnerable and ultimately failed to make much of his Trump attacks against Vukmir. The establishment also held strong in a couple of Minnesota primaries. Smith, who was appointed to the seat after Al Franken's resignation, cruised to victory over Painter. Smith, the former lieutenant governor, has deep ties to Minnesota's Democratic-Farmer-Labor Party, which endorsed her in the special election. And in the 1st District, Republican Jim Hagedorn, who's making his fourth run for Congress, won the GOP primary in the race to replace Rep. Tim Walz (D-Minn.). Hagedorn, the 2016 nominee who came close to unseating Walz, scored the state party's endorsement. Hagedorn, the 2016 nominee who came close to unseating Walz, scored the state party's endorsement. One glaring exception was in Minnesota's governor race where Tim Pawlenty, the former Republican governor, failed to make a comeback bid. Hennepin County Commissioner Jeff Johnson (R) won the primary after closely aligning himself with Trump. Democrats have been making history this cycle, as more female, LGBT and minority candidates run for Congress -and win. In Vermont, Democrats elected the first transgender gubernatorial nominee of a major political party after Christine Hallquist, a first-time candidate and the former CEO of the state's electricity co-op, emerged as the winner of the primary. She now faces Republican Gov. Phil Scott in November, though it'll be an uphill climb for Democrats to take back the governor's mansion. Vermont may be a blue state, and one that Hillary Clinton easily won in 2016, but Scott remains popular, winning his first term by 8 points that same year. And in Minnesota's 5th District, Omar won a crowded Democratic primary, meaning that she'll likely be among the first Muslim women elected to Congress. She ran in the race to replace Ellison, who was the first Muslim elected to Congress in 2006. Omar, who is Somali-American, was endorsed by Alexandria Ocasio-Cortez, a democratic socialist who defeated a longtime incumbent in the New York primary. And in the race to replace Rep. Elizabeth Esty (D-Conn.), Democrat Jahana Hayes, the 2016 Teacher of the Year, would be the first African-American Democrat elected to Congress from Connecticut- if she wins the general election in November. 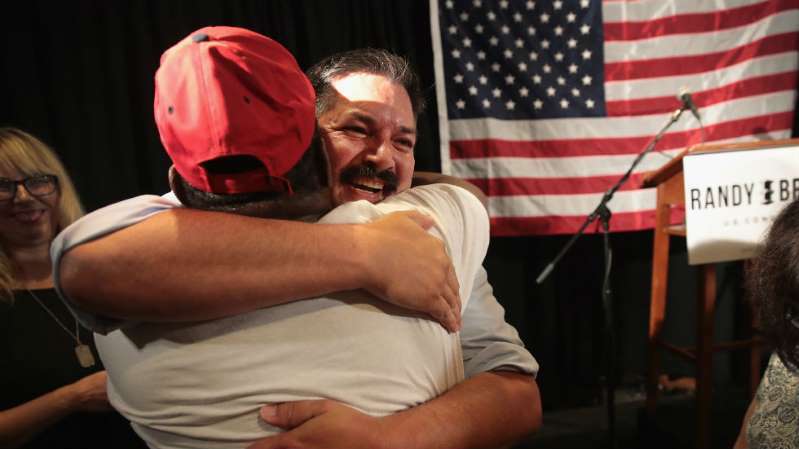 Ironworker Randy Bryce may have secured the Democratic nomination to replace Ryan in his southeast Wisconsin district, but it's not likely to be smooth sailing for the candidate dubbed "Ironstache" as he heads into the general. The mustachioed 53-year-old garnered a reputation as a rising Democratic star after he announced his candidacy last summer in an emotional video about his mother struggling to afford vital drugs, which quickly went viral. But "Ironstache" faced a tougher-than-expected challenge from Janesville school board member Cathy Myers after being hit by a series of negative headlines regarding his past arrests for marijuana possession and driving under the influence, as well as the revelation that he failed to pay child support until after he declared his House bid. Those revelations are sure to fuel Republican attacks ahead of November, complicating his campaign fight against Republican Bryan Steil, who also secured his party's nomination on Tuesday. Steil is a former aide to Ryan and received the endorsement of the outgoing Speaker. What's more, the Cook Political Report rates the district as "leaning Republican," meaning Bryce and the Democrats are almost certain to face a tough path to flipping Wisconsin's 1st District. Will abuse allegations rock Ellison's bid for AG in November? Ellison easily won the Democratic primary for Minnesota attorney general, but it remains to be seen how his campaign will be impacted going forward in the wake of recent abuse allegations. Ellison won 51 percent of the vote against four other Democrats in the open-seat race. Ellison, who was the first Muslim elected to Congress, had been considered the front-runner since he announced his candidacy in June. He went on to win, though the race was upended in recent days after the son of Ellison's ex-girlfriend posted on Facebook that he watched a video where the congressman allegedly dragged his mother off a bed and shouted profanities at her. The ex-girlfriend, Karen Monahan, backed up her son's account. But Ellison denies those allegations, saying that the video referenced doesn't exist. It's still unclear how, or if, the allegations will roil Ellison's campaign going forward. But they're being taken seriously. The Democratic National Committee (DNC) said on Tuesday that it is "reviewing" the abuse allegations levied at Ellison, who serves as DNC vice chairman. Ellison will face former state Rep. Doug Wardlow, who was endorsed by the state Republican Party, in November. "Medicare for All" won't be fading from the headlines any time soon. A number of Democrats running in Tuesday's primaries campaigned heavily on that health-care message. Few candidates did it as poignantly as Bryce, who made single-payer health care a critical part of his campaign messaging, including in a campaign announcement video featuring his mother that quickly went viral. He was endorsed by Sen. Bernie Sanders (I-Vt.), who has championed Medicare for All legislation in the Senate. In Minnesota, Omar ran a progressive platform that includes a single-payer system among other progressive issues. And in Connecticut, Hayes also backs Medicare for All. Republicans have already indicated that they plan to weaponize "Medicare for All," arguing that it'll spook more moderate voters in competitive seats. But Democrats who ran on this platform will ensure that it'll likely remain a campaign issue - though it remains to be seen how frequently they'll talk about it in a general election.